There is no doubt that some of the world’s most renowned dessert dishes come from Italy. Italy’s long history of culinary and baking has contributed to the wide variety of desserts available. Here at Spumoni, we are dedicated to bring the most authentic Italian dessert flavors to America. Spumoni Restaurants offer a wide selection of authentic Italian desserts. 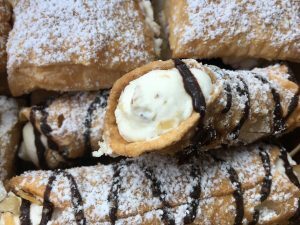 From our signature Spumoni Ice-cream, homemade Tiramisu, to freshly made Cannoli shells. Nothing is better than dessert after a tasty Italian meal. To go with the dessert, we also have fresh brewed espresso coffee and different types of dessert drinks and wines to go with your sweets. Cakes are the staple of desserts. Spumoni Italian restaurants offer a couple different cake varieties. 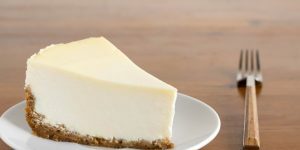 From the audience-favorite New York style cheesecake, we also have chocolate cake if you are in the mood. For a more authentic Italian cake, choose Torta dela Nona. Also known as Grandmother’s Cake. It is made from pastry cream, drops of chocolate, peach glaze and shaved almonds. The Grandmother’s cake has a unique aroma that is fruity yet savory. Try it for yourself! 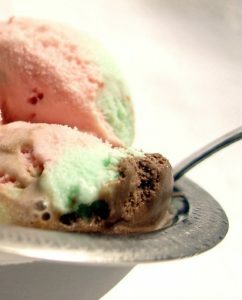 Spumoni Ice Cream is one of our favorites here. It is a combination of strawberry, chocolate, pistachio, and cherry fruits (as shown above). The unique blend between these flavors complements each other well, and it is comparable to the traditional gelato you can find in Italy. If you are into a more American flavor, we have a fudge brownie with Vanilla ice cream. The warmness of the brownie paired up with the sweet cold vanilla ice cream creates a explosion of flavor and texture that will have you wanting for more. If you are looking for a more authentic traditional Italian flavor, look no further. Spumoni follows traditional recipes and is dedicated to bring the authentic dessert taste to America. For example, try our famous Tiramisu. 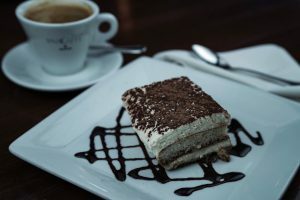 Our tiramisu is made fresh batch by batch, and you can taste the freshness by taking the first bite into it. The soft texture of the cream paired with the coffee-soaked ladyfinger biscuits create a juicy creamy aroma in your mouth, and obviously a cup of coffee on the side would just top off this amazing dessert. Other than Tiramisu, Spumoni restaurants also offer fresh cannolis. We have them in jumbo shells wrapped with Ricotta and Mascarpone cheese. Each bite into the cannoli will leave you wanting for more. Then there goes one cannoli, then two, then three… you will know how irresistable these cannolis are. The perfect blend of crunchiness and softness, and stuffed with the perfect tasting cheeses. Try one for yourself and you will know why Spumoni has the best Italian desserts. In conclusion, you should try Spumoni Restaurants in Santa Monica for our authentic Italian desserts. All of our desserts are made with love and the most authentic Italian recipes. You can taste the freshness and the authenticity throughout your meal, from the appetizers all the way to desserts. That is why Spumoni has the best Italian desserts in the Santa Monica area. Even if you’re not located in Santa Monica, we also have different locations throughout the greater Los Angeles Area so you can be able to find great Italian food anywhere no matter where you are located. Even better, Spumoni is also offering delivery services so you would be able to enjoy Italian food even at the comfort in your own house. Next time you are in the area and craving for Italian dessert, be sure to check out Spumoni Italian restaurants! !